Cook once, eat twice! This recipe makes a tasty dinner, plus we've given you more ingredients so you can transform your cooking into a different and satisfying lunch for the next day. 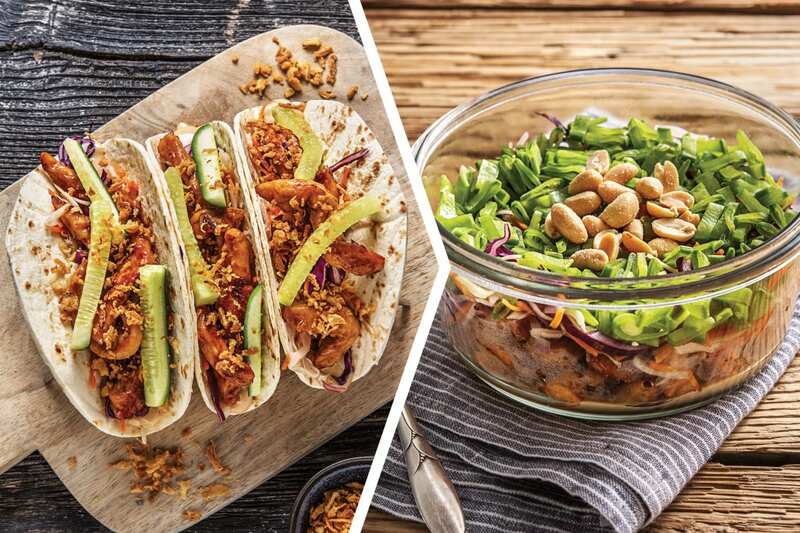 First you’ll have tasty Asian chicken tacos with a crisp slaw, then you can pack up a nutty chicken salad for a satisfying lunch. It's two meals but you're only cooking once! The Nutritional Values table below is only for the dinner portion. The Nutritional Values for the lunch portion are as follows: 3140kJ Energy, 46.6g Fat, 7g Saturated Fat, 31.3g Carbohydrate, 17.5g Sugars, 47.3g Protein, 477mg Sodium. Preheat the oven to 220°C/200°C fan-forced. Cut the sweet potato (unpeeled) into 1cm chunks. Place the sweet potato on an oven tray lined with baking paper, drizzle with olive oil and season with salt and pepper. Toss to coat, then roast for 25-30 minutes or until tender. Set aside until you're ready to make lunch. Slice the cucumber into thin batons. Slice the chicken breast into 1cm strips. Heat a large frying pan over a medium-high heat. Add the sesame seeds and toast, tossing, for 3-4 minutes or until golden. Transfer to a small bowl. Add 50g of mayonnaise, the sesame oil, soy sauce, sugar and rice wine vinegar. 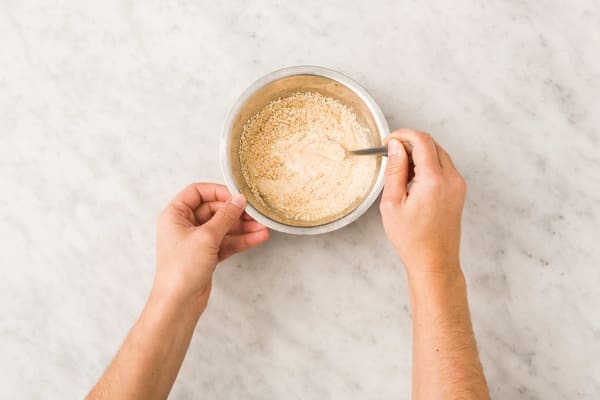 Whisk together until combined, then set aside until you're ready to make lunch. Return the frying pan to a high heat with a drizzle of olive oil. When the oil is hot, add 1/2 the chicken and cook, tossing, for 4-5 minutes or until cooked through. Transfer to a plate to rest. Repeat with the remaining chicken. Remove the pan from the heat and add the Sichuan garlic paste (see ingredients list). 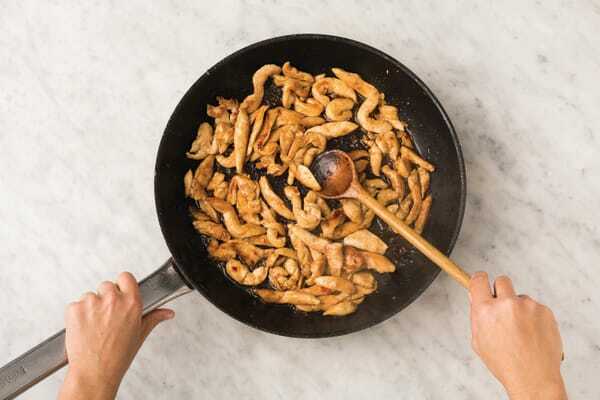 Return the chicken to the pan with a pinch of salt and pepper and stir to coat. 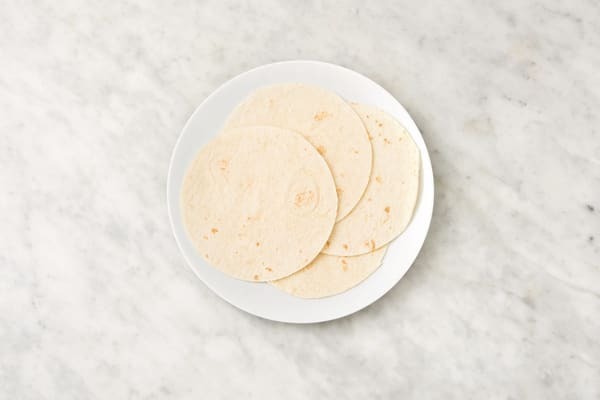 While the chicken is cooking, heat the mini flour tortillas in a sandwich press or microwave on a plate in 10 second bursts or until warm. In a small bowl, combine the remaining mayonnaise with the Japanese dressing. Set aside 2 portions of chicken (about 1 cup) and most of the slaw mix until you're ready to make lunch. 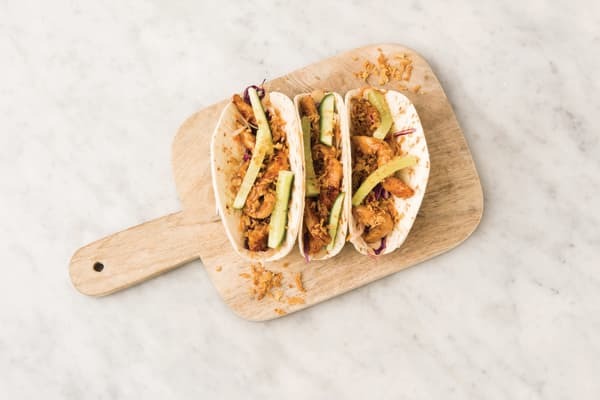 Build the tacos by spreading the tortillas with a little Japanese mayo, then adding a helping of the remaining slaw mix, Sichuan garlic chicken, cucumber and a sprinkling of crispy shallots. When you're ready to pack lunch, trim and thinly slice the snow peas. Thinly slice the long red chilli (if using). Divide the sesame dressing between two reusable containers. Top with the sweet potato, reserved chicken, reserved slaw mix, snow peas, long red chilli (if using) and roasted peanut packets. Refrigerate. 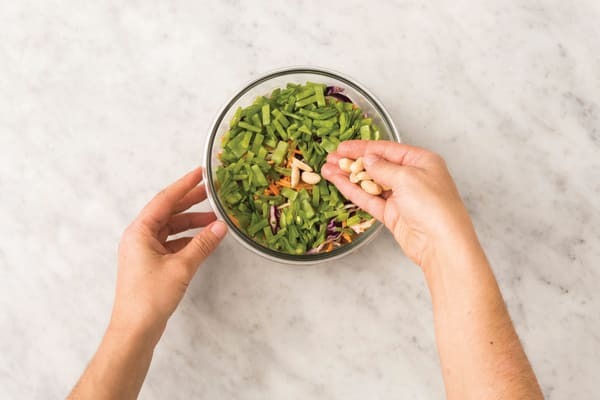 When you're ready to serve lunch, toss to coat the salad in the dressing and sprinkle with the roasted peanuts. Season to taste with salt and pepper. TIP: Packing the dressing on the bottom keeps the salad crisp overnight!